Dan Kennerly was a soldier in World War II – and he kept a diary. Kennerly grew up in the South, in Georgia. He had never seen snow actually stick to the ground. But in World War II he decided to volunteer for an unlikely new unit of the US Army: The Ski Troops. They were officially called the 10th Mountain Division. It began as an experiment to train skiers and climbers to fight in the most difficult, mountainous terrain in Europe. 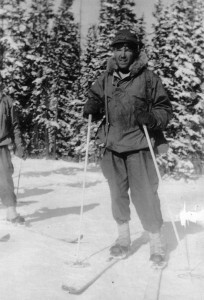 Some of the men who joined the division were skiers already, others had never seen a ski in their lives. They were also trained in snowshoeing and rock climbing. And they learned cold-weather survival tactics, like how to build a snow cave. With their specialized training, the men of the 10th Mountain Division would go on to lead a series of daring assaults against the German army in the mountains of Italy. The 10th Mountain Division would also have one of the highest casualty rates of the war. On this episode of the Radio Diaries Podcast, meet the skiers who fought the Nazis. Radio Diaries is part of Radiotopia from PRX, a collective of the best story-driven podcasts on the planet. This week’s episode is sponsored by Smithsonian Channel’s Million Dollar American Princesses.